46And We sent, following in their footsteps, Jesus, the son of Mary, CONFIRMING that which came before him in the Torah; and We gave him the GOSPEL, IN WHICH WAS GUIDANCE AND LIGHT and confirming that which preceded it of the Torah as guidance and instruction for the righteous. The Qur'an even says it was sent to confirm and protect the Bible and the Torah. Yet the message of the Qur'an is completely opposite to that of the Bible and Torah. This has led some say the Bible has been corrupted but the Qur'an says that this is not possible with Allah's word. Also if the Bible has been corrupted, the Qur'an failed in its purpose to guard the Bible, as the words of Allah. Furthermore the Qur'an CLEARLY instructs muslims to ask those who read the Scriptures (Bible) if they have doubts. 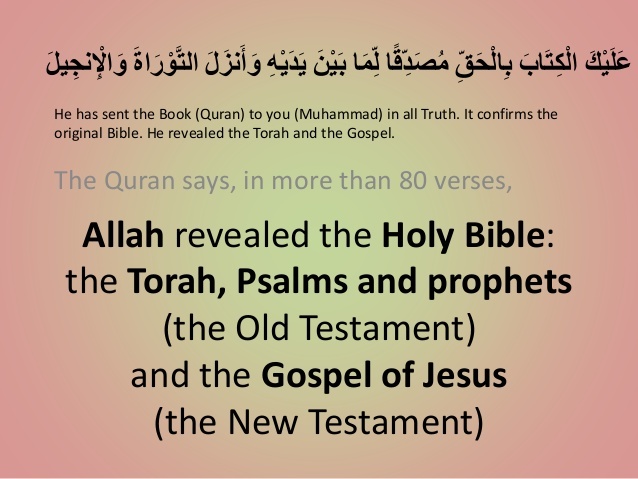 And if any think the Bible is corrupted or are confused whether the Catholic Bible with its 73 books or the Protestant 66 books (Both have 27 New Testament books but differ in the number Old Testament books) is correct, the Quran and the Bible clearly tell us who to ask about this. . The Qur'an and the Bible indicate that the Jews were entrusted The Jews accepted as God inspired are exact same 39 Old Testament books that Protestants have. So obviously the Bible has not been corrupted. And the Qur'an requires you accept ALL of Allah's words, which it lists the Torah and the Bible as Allah's words. Then the Bible must be accepted by Muslims when it clearly teaches that Jesus is the son of God who died a substitutionary death for the whole world. Even demons knew Jesus was the Son of God. Even Gabriel called Jesus the Son of God. Jesus said, "Say ye of him, whom the Father hath sanctified, and sent into the world, Thou blasphemest; because I said, I am the Son of God?" 37 And Jesus said unto him, Thou hast both SEEN HIM, and it is HE THAT TALK with thee. 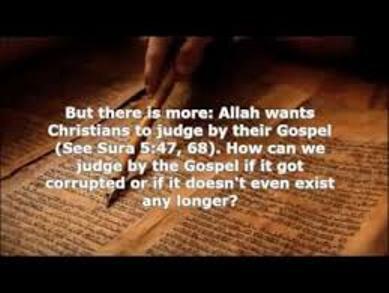 The problem is that the Qur'an disagrees with the Bible, that it confirms is the unchangeable, incorruptible words of Allah. They say: "(Allah) Most Gracious has begotten a son!" Indeed ye have put forth a thing most monstrous! The Qur'an itself tells Muslims that they are to listen to the Bible as the incorruptible words of Allah. Yet if you listen to the Bible, it says that Jesus is the Son of God sent into this world to die for sinful men of this world and that any who deny Jesus as being the Son of God is false. Wouldn't you, as a Muslim, want to get to know the real God of the universe? The Bible says He is Yahweh and He is the creator of this universe and each and every one of us. He does not ask for slavery nor submission nor mindless jihad from us. Instead he offers the real ETERNAL LIFE with Him in Heaven and only requires that you repent of your sins and trust by believing in His Son Jesus. It is really that simple. The free gift He holds out to you is real. All you have to do is reach out and accept it, knowing there is nothing you can do to pay Him back enough for the life of His only Son. Won't you pray this prayer today and ask Jesus into your heart?